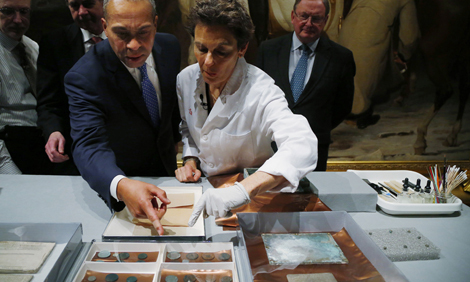 Outgoing governor of Massachusetts Deval Patrick and museum conservator Pam Hatchfield look at artifacts removed from the 1795 time capsule. Imagine if you had the chance to share something with people in the future, but all you could give them had to fit inside a small box. What would you choose to put in it? You may be familiar with the idea of a “time capsule.” It’s a container holding historical records or objects that represent present-day culture. A time capsule is usually buried or placed somewhere safe with the hope that people will discover it in the future. Historians in Boston, Massachusetts, have recently unearthed and opened a time capsule. It was first placed under the cornerstone of the Massachusetts State House on July 4, 1795. The time capsule was put there by well-known leaders of the American Revolution—Governor Samuel Adams, silversmith Paul Revere, and militia officer Colonel William Scollay. The original time capsule had a cowhide cover and was first discovered when repairs were made to the state house in 1855. At that time, its contents were cataloged and cleaned, and more items were added. The artifacts were then placed in a brass box and put back under the cornerstone. In December 2014, officials decided that the time capsule needed to be removed after a water leak was discovered near the cornerstone. Pam Hatchfield, a conservator at Boston’s Museum of Fine Arts (MFA), carefully removed the box from the cornerstone. A conservator is someone who is responsible for the care and restoration of museum artifacts. The coins and other items from the time capsule will be on display at the MFA for a limited time. Museum officials announced that the time capsule will be placed back under the cornerstone. They are wondering if they should add artifacts that represent the culture of Boston and America today. What kinds of items do you think they should include? Who put together the time capsule in 1795? Which item found in the time capsule shows an image of George Washington?